208 pages | 14 B/W Illus. The 2008 credit crisis started with the failure of one large bank: Lehman Brothers. Since then the focus of both politicians and regulators has been on stabilising the economy and preventing future financial instability. At this juncture, we are at the last stage of future-proofing the financial sector by raising capital requirements and tightening financial regulation. Now the policy agenda needs to concentrate on transforming the banking sector into an engine for growth. Reviving competition in the banking sector after the state interventions of the past years is a key step in this process. 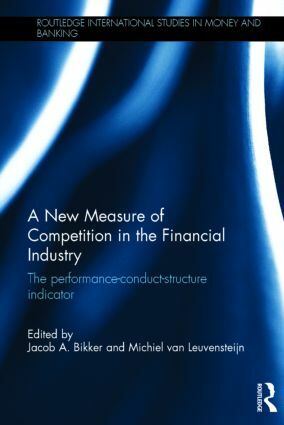 This book introduces and explains a relatively new concept in competition measurement: the performance-conduct-structure (PCS) indicator. The key idea behind this measure is that a firm’s efficiency is more highly rewarded in terms of market share and profit, the stronger competitive pressure is. The book begins by explaining the financial market’s fundamental obstacles to competition presenting a brief survey of the complex relationship between financial stability and competition. The theoretical contributions of Hay and Liu and Boone provide the theoretical underpinning for the PCS indicator, while its application to banking and insurance illustrates its empirical qualities. Finally, this book presents a systematic comparison between the results of this approach and (all) existing methods as applied to 46 countries, over the same sample period. This book presents a comprehensive overview of the knowns and unknowns of financial sector competition for commercial and central bankers, policy-makers, supervisors and academics alike. Jacob Bikker is Research-coordinator, Supervisory Policy Division, Strategy Department, De Nederlandsche Bank, Amsterdam, The Netherlands, and Professor, Utrecht School of Economics, Utrecht University, the Netherlands. Michiel van Leuvensteijn is Senior Policy Advisor, Group Strategy and Policy Division, All Pension Group (APG), Amsterdam, the Netherlands.